Maru continued to make GSL history as he swept Jin Air teammate Trap 4-0 to reach his fourth consecutive Code S finals. Maru tied soO's record for four straight finals appearances (set in 2013-2014), and has a chance to break his own record of three consecutive Code S championships with an incredible fourth title in a row. Although Trap had proven his PvT prowess with prior victories against INnoVation and TY, he was unable to summon the same form in his first ever Code S semifinal match. Maru's harassment and subsequent attacks steamrolled Trap in the first two sets, and Trap's later attempts at all-ins and aggression could only seem desperate in comparison. A well deserved win by Maru. As Artosis said, Trap should have played Colossus against Maru since Maru is weak against Colossus builds. Also, that was some bad micro by Trap throughout the series, especially in game 4. Why do some people always (advertently) forget that Inno also won 4 GSLs (if counts GSL vs The World)? I'm wondering a few things, the first: Did sOs decide to train with Maru instead of Trap? Second: Is Maru's play (no proxies, lots of ravens) indicative of how he will play against Classic? Did he break the matchup [when playing Maru level] or thirdly, is he just hiding his true strategies until he cheeses the moon out of Classic in some crazy proxy builds and mass widow mine drop play that blows all of our minds as he becomes the 4x in a row GSL champ?! If Maru wins the final I think he really is the best player outside of Europe. Even if Maru wins this GSL, I would still say Innovation is the GOAT of SC2. With the WESG win this year, Innovation just added another major tournament win to his trophy case. Without the WESG win, I would consider that if Maru wins this GSL, he is very close to Innovation or maybe Maru even surpasses Innovation. But after the WESG win, Innovation is still the GOAT. Maru is still young and Innovation is getting old. So if Maru keeps it up, he may surpass Innovation eventually. Having said that, Serral is also very young so Serral has many more tournaments to win in the future and perhaps it will be Serral and Maru trying to take over as GOAT from Innovation. he never faced serral directly and serral has never won a tourney that included opponents getting 9 days to get ready for a bo7 against him. 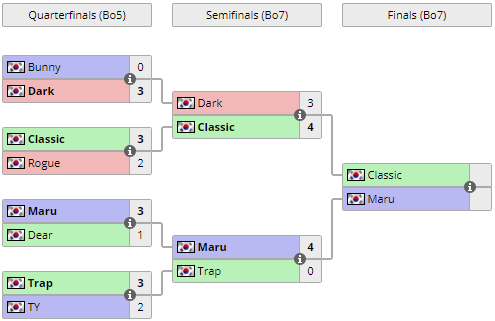 if he won even 1 like that I'd say he could be the choice, but while maru was able to take quick tourneys during 2018, serral has never even been in a slow GSL. WESG 2017 they faced directly :o. Hate to do it, but I'm cheering for Classic. Guy needs a GSL trophy more than Maru does right now. Still, I'd have to say Maru is the strong favorite here. If (and likely when) Maru wins this GSL finals, I think that's the tipping point to crown him best player (so far) in 2019. Unless Serral wins something big in the meantime.